Have you ever wanted to hide rows from your DispForm if they are empty? If you want to hide the table row based on other criteria, adapt the check in line 7 to fit your need – either it’s by length or it’s by string comparison. Nice, this can be useful for lists wiht many columns for ex. Thanks Alexander! I am using this “Hide” script on many DispForms and it’s a godsend! Do you know if the script can be changed to be able to print to PDF and still hide the blanks fields? If I use the browser print function, the fields are hidden but if I print to PDF, the hidden fields appear. Do you know how I can hide certain fields in DispForm? Not necessarily empty fields, but fields I don’t want the public to see at all. Dynamic expand/collapse fields or array of fields. In this code you should find your answer – if not, let me know and i will show you. That’s almost what I need, except that I don’t need the rule to be conditional. There are some fields that I don’t want them to appear at all. It just works! Thank you Alexander! Alexandar, i’ve been using a lot of your example and they are great! I’m having a hard time making this work in DispForm.aspx. I’ve got a lookup column in the newform, but don’t know how to obtain the value in the dispform. Alexandar… I’ve tried a number of combinations of code and it isn’t creating an alert… I can’t paste the code as it doesn’t seem to go through and show up on the comments. I tried this below, and it doesn’t work. I’ve also tried a number of combinations… (I know i’m the URL to jquery is corect as it is working fine in other code i’m doing. Thank you! Your code works great and displays exactly correct in the message box, but I can’t get it to work in an if statement… I’ve tried it two ways. Alexander that did it! Thank you soo much… I really appreciate your help!! Would this code also work in the EditForm.aspx when the field is a lookup column? None of this works for me. Have copied it into a CEWP and reference the JS and tested it is working. But, nothing hides! Help! Have you remembered to put the CEWP below the list form? Alex, the solution you provided for Brandon to display the value of a field in dispForm.aspx worked for me too. You are simply awesome. Thank you for helping all of us. Keep up the good work. Thank you, and I’m glad you could use the code. 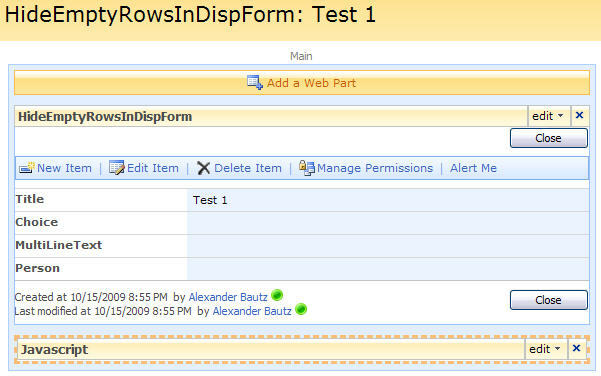 Would this code also work in the customized EditForm.aspx and customized DispForm.aspx? Is there a way to modify the code so that in addition to hiding all empty fields, it also hides fields that have a field internal name that starts with two dash characters “–” (even if that field contains data). When combining this functionality with the “headings” script the headings get hidden since they are blank :(. Can we overcome this by hiding all blank fields except the ones with specific field name (or the ones that start with #H# for your first headings method), and if so how? 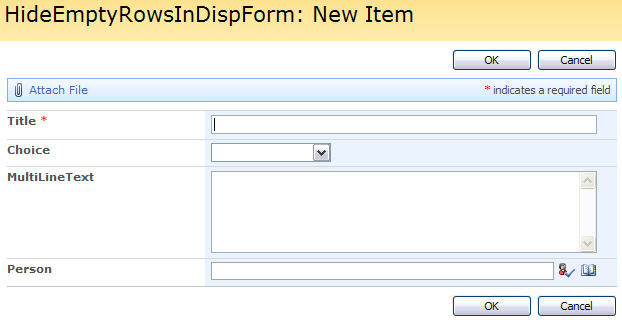 This script is all about DispForm and hiding checkboxes and radiobuttons should work in the same way as other columns. Hi Alexander, I wasnt very clear. I have a Yes/No checkbox box on the form and I want to it hide when set as ‘no’ (not checked). What additional code do I need to add on line 7 as it is currently visible on the DispForm even when all other empty fields are hidden? The Yes/No check box is special in the way that NOT selected results in a “No” and not an empty string. Thanks Alexander, you’re the best! still no luck, so I am guessing it has something to do with how the fields are returned with the accordian script. Any hints? This is not a deal breaker but would be helpful. I am so sorry. I figured it out again. It was the script order. If I put the hide empty fields after the accordian it worked. Sorry to bother. I got this to work on my site… however it also my hides my Picture field (I am using this on a Contact list). I think I just need an If statement right before for the hide command checking to see if the FieldName is “Picture”. I can seem to figure out the correct syntax to do this. Any help would be greatly appreciated. The script works perfect. But i need some change. I want to leave one specific row (we name it ‘Zugewiesen’ be visible, even if its empty. How can this be done? The script is not working for me. I have copied the source to a text file, uploaded to a document library and copied the location of the file and pasted inside a content editor web part on the editdispform. I am using SharePoint 2010. Does that matter at all? Do I need to add the jquery library reference above the first line of code? Change the script “src” to the jQuery file. Thanks Alexander! It worked perfectly. I was trying to customize your script to only hide a with 0 characters after a “:” character. This is because my field names are showing, so even if the field value was left blank, there is still the field name text in the . I tried the script below but it is not working. Do you have any suggestions or corrections to my code? I was trying to customize your script to only hide a tr with 0 characters after a “:” character. This is because my field names are showing, so even if the field value was left blank, there is still the field name text in the td. I tried the script below but it is not working. Do you have any suggestions or corrections to my code? Anyway, do you any code to do the same in editform.aspx? I have fixed the regex – thanks. This is written “freehand” and not tested, but should work for text / choice columns. Also,if I wanna use one of your scripts on the edit or add forms, would I have to change something? The reason the last one worked must have to do with the wrapping with $(document).ready. I suspect your CEWP is not placed below the form web part? – this would explain why the first one did not work and the second did. This code will never work in NewForm or EditForm as all it does is to look at the text in the “td” – and if empty – hide the row. the CEWP was below the web part in both cases..
also, when I try the other scripts, even with the wrapping with $(document).ready, I don’t get the expected behavior…would it have smt to do with the fact that I am sharepoint online? Thanks Alex , much appreciated ! If you are on https you must only refer scripts from https sources. That did it!..i was an HTTP link..now I am using a protocol-relative url. I have tried the below script to hide the column in dispform.aspx which is null value but didn’t work. it also not works , I have added script into txt file and give link into CEWP. Which version of SharePoint are you running? Have you tried the solution linked in mu previous comment? Yes, I have added the following script which you have mentioned. Refer spjs-utility.js and use getFieldValue, and the code from the comment. Yes, the script was working now after creating the customize form of display from. Is there’s something I’m doing wrong?